With read-only access you will probably like to "comment" a Choosle or to work on your own "copy" of it. 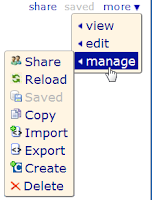 While with edit access you can work on the Choosle directly and the "save" command becomes more important than the "copy" one. 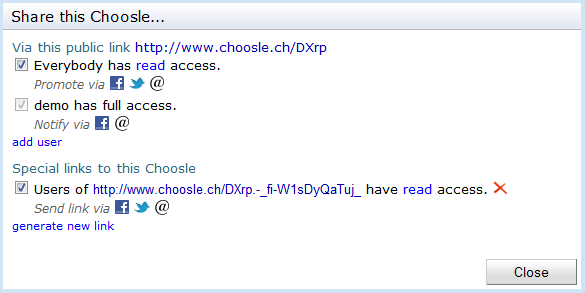 As the administrator of your own Choosle you might want to "share" it rather than writing comments your content. Of course all the other menus are still available as sub-menus of the "more" pull-down. 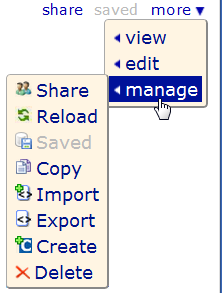 After two previous versions (June 2011 and August 2011) the new sharing dialog has become more powerful, yet still easy to use. You can now share your Choosle with your friends directly. No special link necessary. Of course you can still generate special links to share with any group of people. Who ever receives such a link has access as specified here, independent of his login. Shortcuts allow you to quickly send Choosle messages via Facebook, Email or Twitter. 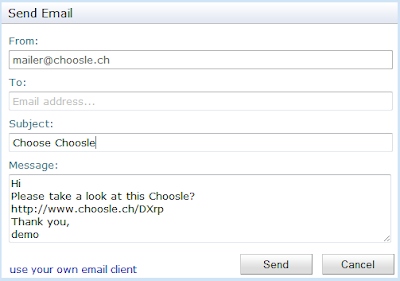 Simply click on the corresponding shortcut image and a message with the link to your Choosle will be prepared for you. You can also try to use your own Email client (depends on your system setup). Now the author and all the editors are listed next to the title of the Choosle. Also the date shows the time of the last change instead of the creation date. The tool-tip still shows the author and the creation time.